This month's edition is introduced by none other than an example from the most desireable parallel set of the entire decade. We're talking about 1996 Select Certified Mirror Golds. 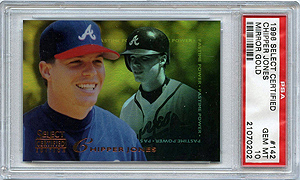 This Chipper Jones hails from the even more scarcer Pastime Power (PP) subset that capstones the end of the set. The PP subset features the hottest players of '96, which also means if they're in the PP set, they're also in the base set. If you collect a player who made it into the PP subset, you're one of the lucky collectors who has to track down not one but two cards of your player from this unicorn parallel set. Coupled with scarcity is value, which equates to a significant financial commitment when you do find any one card you need in the set. This is especially the case with superstars, which is a category Chipper Jones falls into comfortably. Not only was 1996 the year that introduced Mirror Golds, it was also a time when dealers put their high end autographed cards on display under the lights for all to see and marvel at as the ink fades and fades some more until sometimes it disappears entirely. 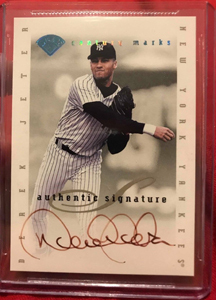 As for this Derek Jeter, at first glance all we see is that dreaded light damaged autograph. While I've definitely seen worse, this example features the result often found on signed cards from this era. While I'm not surprised to see the light damaged autograph, I am shocked by the sale price. At that price, I'd rather just keep saving and wait for a bolder example. Notice how this card is contained within a BGS inner sleeve. Yep, it was once graded but cracked out in an effort to hopefully make a higher return. Grading something doesn't always help resale value and this could've been one of those times when cracking something out made more sense. While it's been confirmed that at least some of these 1998 Ultra Masterpieces have print runs of at least two, they still carry strong desirability with most collectors. This particular example was listed for a while before it finally closed and quite frankly, given the set and player I think the end price is modest. While not the flashiest parallels, they're certainly some of the rarest. 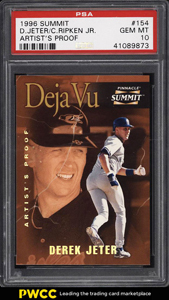 In 1996, the Summit arm of Pinnacle brought us a subset called Deja Vu, which features rookie era players in the foreground and veterans in the background. It's a cool set; I like it. Along with the base cards, we're offered a few different interesting parallels. The rarest of which is the always popular Artist's Proof (AP) parallel. Now you wouldn't think it at first but the AP parallels of these Deja Vu subset cards are some of the most desired APs of the decade. The reason being is they cater to the likes of two separate collector demographics - collectors of the foreground players and collectors of the background players. Also too, if you collect Ripken and this card was listed as Jeter with no Ripken mention, you wouldn't see it unless you knew of this cards existence and actively searched for 1996 Summit Jeter cards. Finally, depending on the player combination, things can get pretty hairy with these. For example, Frank Thomas is the background player on the Ryan Klesko. How many sellers bother to list Klesko stuff in the current market? Exactly my point. This Shigetoshi Hasegawa Masterpiece has changed hands for the second time this year. In June, it was purchased on eBay for $550, then immediately relisted at $2295. After a while, I suppose the seller began fielding offers. Two months later, the seller accepted an offer of $1,250. After just two months, the seller made a cool $700 on this card. Not bad. I had to add this Ryan/Maddux dual auto to the list because it's rad! 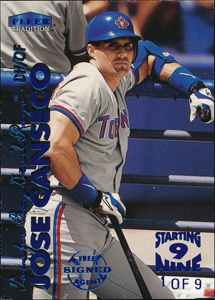 Just think of how great a card like this would have been to pull in 1998. Man, what a great add to any collection. Gushing aside, here's the deal with these dual autos. 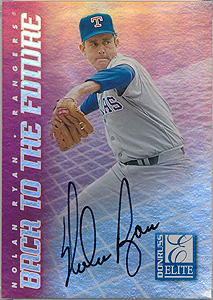 The first 100 cards in the 1998 Donruss Elite Back to the Future print run of 1500 were signed by both players on each card. However, due to a combination of problems obtaining autographs from certain players and the onset of the Pinnacle bankruptcy, not all cards can be found with autographed versions. 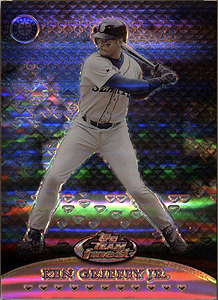 The way that Griffey Gold Refractor was scanned, it looks more like a Red Refractor. I tried to work magic in PS to bring out the bold colors a little but it still looks Red to me. Regardless, however, these 1999 Finest Team Finest Gold Refractors are very tough to find. It took me years to find my Thomas and I haven't seen another one since. 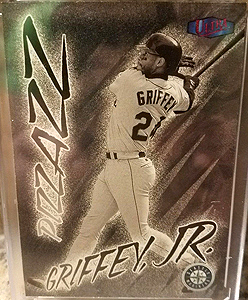 These 1999 Finest Team Finest Refractors come in three different colors: Blue, Red, and Gold, each containing respectively lower print runs and 10% of the total print run of their non-Refractor counterparts. Jose Canseco makes an appearance in this months addition with the incorporation of a mythically rare 1999 Fleer Tradition Starting 9 parallel. For a set this rare, you'd think Fleer would've added a little more flair to it. Making the blue foil holofoil would've been a simple but stylish approach. Different strokes I guess. For a card with a print run of just 9 copies, it's nice to at least see one anywhere in a whole lifetime. 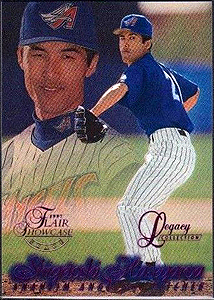 These 1993 Finest Refractors have always been desirable and expensive. 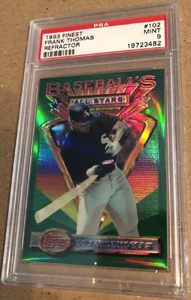 However, there was a time when the Frank Thomas could be had raw for <$125. It was late 2011 and it was when I bought mine. It was a different time. 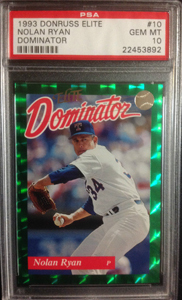 The Ryan 1993 Donruss Elite Dominators card may be obvious to most but consider how these cards were released. They were included with specially marked boxes of 1993 Donruss made available exclusively through the Home Shopping Network. When initially made released, they were pressed raw between two thick slabs of plastic with screws tightly fastened in each of the four corners. The obnoxiously thick lucie case thing that was typical of early '90s archival methods. Thing is, this method is actually very bad for cardboard. If pressed long enough, the cardboard adheres itself to the plastic causing the removal process to be a fatal outcome. While you're thinking about that, think about this - these 1993 Donruss Elite Dominators have foil frames that go to the edges of the cards. When these are removed from the thick lucite cases they come in, it's almost always guaranteed some of the green foil will be left on the plastic leaving the card in much lesser condition than Gem Mt; you're lucky to get even a 7. I know this because I've personally removed a Frank Thomas from its original housing and to this day, some of the card remains on the case. It's downright heartbreaking. All of this is why PSA 10 examples carry serious premiums.